John Wintergreen (Blake) dreams of being a detective, but for now is stuck on a motorcycle beat, as his short stature is literally looked down upon by his superiors. However, when he makes a breakthrough, pointing out that an apparent suicide is more likely to be something more suspicious, John is given the opportunity to work alongside brilliant detective Harve Poole (Ryan). It’s not uncommon when watching a film to think it would work well as part of a double-bill with another feature. What’s less common, however, is for a film to only work in such a context. This is the case here, as I believe that without seeing 1969’s Easy Rider, it would be extremely difficult to fully grasp what Electra Glide in Blue is doing, as it feels like a direct response to Dennis Hopper and Peter Fonda’s film, despite arriving four years later. It’s not just that they both deal predominantly with motorcyclists, it’s more that they both seem to tell the same story from different viewpoints – Easy Rider saw Hopper and Fonda travelling from L.A. to New Orleans to try and find America (read: hippies), whereas Electra takes the perspective of the motorcycle cops out to stop – or at least investigate – any meandering vagrant types – such as hippies and bikers – who could potentially pose a threat to their regimented way of living. The fact that the two films come to the same conclusion, and that there’s even a scene where John is performing target practice on a still taken from the movie really cements this home in an entirely not-too-subtle manner. Despite the suicide/homicide investigation, this is far from being a traditional whodunnit. This is more about John finding his place in the world – or even if he has one. His dreams of becoming a detective are all but dashed once he meets and spends more than a few minutes with the film’s highlight, Mitchell Ryan’s Harve Poole. Poole is the epitome of blowhards, waxing on philosophically with such quotes as “The night is talking to us, sit down and listen” or “My religion is myself. When I talk to myself, I talk to the whole world, and right now the whole world is answering me.” He’s delusional to the point of hilarity, which really adds to the film’s sense of parody. It often feels like it’s a satire on the police action movies of the 80s and 90s – which would have been difficult to predict, as this came out in 1973. There’s a couple of dressing montages which give the impression that the person getting dressed is going to spend the day abseiling through high-rise windows, infiltrating criminal underbellies and generally kicking asses and taking names, but in actual fact the day will be spent on a chunky motorcycle, fining truck drivers for using incorrect routes or advising people to fit an appropriate bumper. This should have been made a couple of years after Cobra came out, not 13 years beforehand. 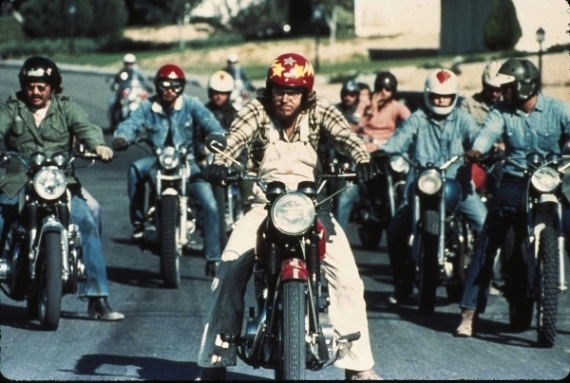 At times the film takes a meandering, unfocussed approach to storytelling – there’s a musical performance in there, as well as a thrilling chase between a biker gang, two motorcycle cops and some police cars, but which would have been far more gripping were it not scored like an episode of Starsky and Hutch. There’s also a smattering of scene-ruining extras – a woman at the police station has clearly never walked in a uniform before, and a post-crash policeman gets a little overzealous with his fist shaking, but these are minor niggles. Overall, it’s a decent character study of a guy who isn’t what he originally seems to be, trying to achieve an ambition that just may not be for him. See it for Ryan’s grandstanding alone. This entry was posted in 07/10, Blueprint Review, Choose Film, Empire Top 500, Review, The List and tagged Billy "Green" Bush, Electra Glide in Blue, Elisha Cook Jr, James William Guerico, Jeannine Riley, Mitchell Ryan, Robert Blake by jaycluitt. Bookmark the permalink.